Scientists have found a new way of testing for the genes of particular kinds of fish quickly, cheaply and accurately. The breakthrough will benefit marine ecology, where it's already shown that the mix of fish larvae in the English channel is different from what we thought, and could also help detect mislabelled fish - in fact, it's already done so, spotting fraudulent so-called anchovies, sardines and sprat. The new method can distinguish between different species at stages of life when they look almost identical, or even when they have been industrially processed beyond recognition. It is known as high-resolution melt analysis, and is already used in medical biology. The new study shows that it's also up to the job of identifying the larvae of clupeids - the family that includes anchovies, sardines and herring. These are small but valuable fish that look similar even as adults and are extremely hard to distinguish as tiny larvae, even for experts with microscopes. It can check a sample of living material for the presence of genetic material from a particular species quickly and simply, without the multiple possibilities for human error and sample contamination presented by the more complex and time-consuming techniques used until now. Testing the technique on larvae sampled in the waters off southwest England, the scientists found an abundance of herring, but absolutely no anchovy. This was a big surprise, since the former is a cold-water species that's at the very southern limit of its range in these waters, while anchovies prefer warmer waters and as a result of increasing sea temperatures may favour the English Channel. Until now the prevailing view was that there were barely any juvenile herring in this area, particularly as the water has steadily warmed in recent decades because of climate change. 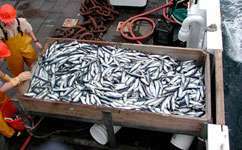 'We expected anchovy but fewer herring; we found the opposite,' adds co-author Dr Andrew Griffiths of the University of Salford. As well as looking at larvae in the wild, the team also examined industrially-processed fish products to see if they contained the species they claimed. Overall, the picture was relatively positive; only 8.3 per cent of products were mislabelled. There were less encouraging areas, though. Three of the tested products were labelled as containing 'sardine', 'Portuguese sardine' and 'brisling' (another name for sprat). None of these turned out to be what they claimed; analysis showed they were neither sardines nor sprats, and researchers aren't sure whether they were even members of the clupeid family - it's possible they came from cheaper clupeids, or members of a different group entirely. The technique can only test for species it's been specially prepared for, so it's not possible to say for sure without more experiments. Adapting it to deal with other kinds of fish would be a relatively simple matter, though. Products labelled as anchovy proved more reliable; only one of eleven tested turned out to contain something else, in this case sardine. Other studies have found much higher levels of mislabelling – one, from 2010, found 25 per cent of fresh and 80 per cent of smoked fish samples in Irish supermarkets weren't what their packaging claimed. Griffiths now hopes to go back through the Marine Biological Association's longstanding records of microscopic life in the channel and use the technique to analyse the populations of different fish larvae over time in order to understand how the change with the climate and other environmental factors. The paper appears in ICES Journal of Marine Science.